Although the ‘Miranda Manor House’ and ‘Prelo Chapel’ were declared Protected Historic Monuments during the early 1980’s, they were in a state of near ruin when the present owners took them on in 1998 – and five years of meticulous restoration followed. 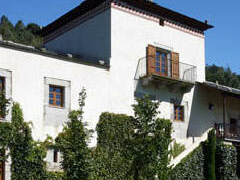 The earliest parts of the building are reputed to date from the 16th century when the manor was the home of local nobility: the family of González de Prelo y Castrillón. Indeed, their coat of arms is to be found over the main entrance. The hotel offers just five guest rooms in all: three double bedrooms and two suites. Of these, ‘The South Bedroom’ is a deluxe double situated on the upper floor of the tower (itself forming part of the original building) and features some beautiful parts of the roof structure. Most feature antique furnishings. Public rooms include two lounges (one set within the tower), a library, and dining room. The Palacio de Prelo Hotel is set in truly rural surroundings, situated as it is within the Parque Histórico del Navia (the Navia Natural Park) in the west of Asturias. Mountain landscapes abound here; as indeed, it seems, do very happy guests.